EARHART, AMELIA. (1897-1937?). American aviatrix; the first woman to pilot a plane solo across the Atlantic and who, in July 1937, mysteriously disappeared over the Pacific on a flight from New Guinea to Howland Island. SP. (“Amelia Earhart”). 1p. 4to. (Burbank, circa 1935). 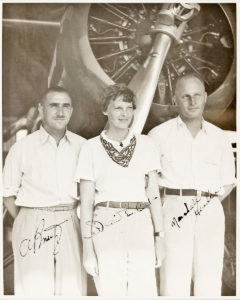 A black-and-white photograph of Earhart standing in front of the Earhart Vega at United Airport flanked by Hollywood stunt pilot ALBERT PAUL MANTZ (1903-1965, “AP Mantz”) and Lockheed test pilot MARSHALL HEADLE (1893-1945, “Marshall Headle”), who have also signed. 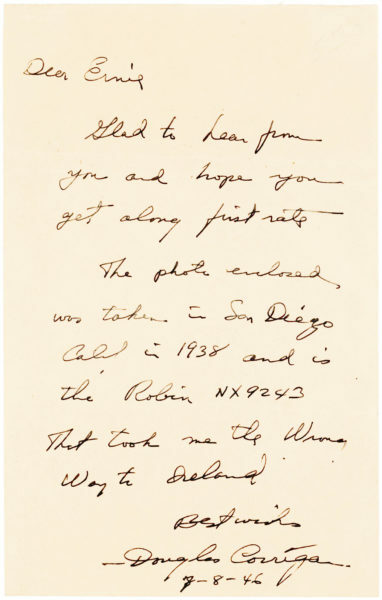 Earhart began challenging existing aviation records following the purchase of her first airplane in 1922. In 1928, with the encouragement of her future husband, publisher George Putnam, she became the first woman to make a transatlantic flight, and in 1932, she became the first woman to fly solo across the Atlantic. On January 12, 1935, Earhart piloted her Lockheed Vega to become the first woman to fly solo over the Pacific. Mantz acted as her technical advisor an helped prepare her for the flight with Headle on hand to assist with her Lockheed aircraft. Earhart’s success led her to be named America’s Outstanding Airwoman by the Harmon Trophy committee. Two years later, in March 1937, she began her ill-fated attempt to fly around the world. 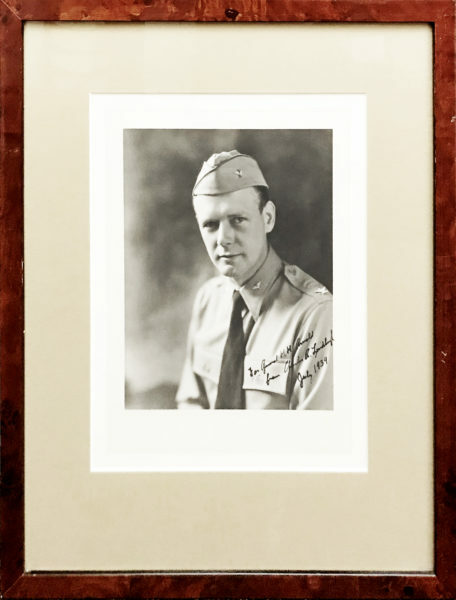 Mantz accompanied Earhart, co-pilot Fred Noonan, and radio operator and navigator Harry Manning on the first leg of the journey from Oakland to Hawaii, but their plane required repairs and forced the postponement of the venture. Earhart undertook a second attempt in June with only Noonan on board. Radio contact was lost on July 2, as her aircraft disappeared over the Pacific enroute from New Guinea to Howland Island. “Despite the extreme unlikelihood of her having survived, speculation as to the nature of her flight and its true outcome – including the notion that hers was a clandestine intelligence mission for the U.S. Navy – continued for decades,” (Liberty’s Women, McHenry). 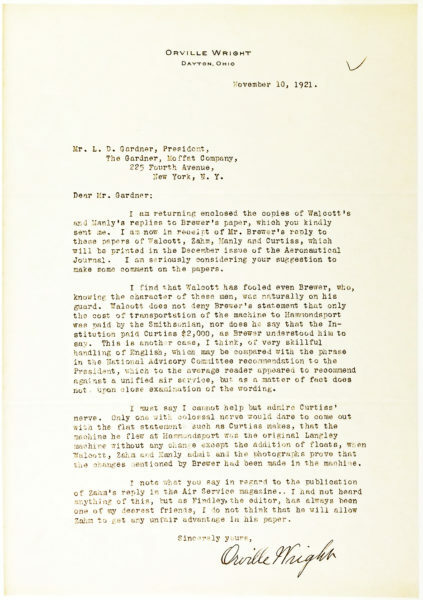 Earhart’s name was a co-respondent in Mantz’s divorce proceedings but the well-known stunt pilot insisted their relationship was strictly professional. Headle tested more than 300 Lockheed planes on their maiden flights. 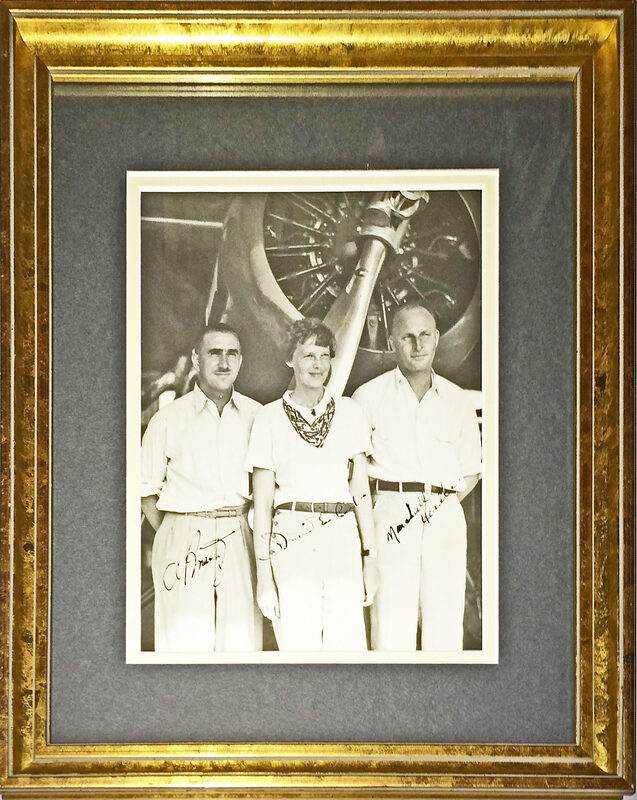 Our image was captured by an unknown photographer at Burbank’s United Airport around 1935 and described by Lockheed employee Coralie Hewitt Tillack, in her history of the facility, Once Upon an Airport, (http://digital-library.csun.edu/cdm/ref/collection/SFVH/id/3220). Earhart’s Lockheed Vega 5B, which she purchased in 1930 and called her “little red bus,” is now in the collection of the Smithsonian National Air and Space Museum. With some minor surface wear. Archivally matted and framed. In very good condition and rare!